Life last week? What about the whole week that just happened? I know, this post would be more fitting to post earlier in the week. However, this week led to me negotiating agreement terms with music managers, helping to plan photo shoots, and many other activities that led to me arriving hope late and demanding a pizza and a bottle of wine. However, I can ensure that last week was a great week and this week was equally lovely, which you will hear about next week. Last week I found myself networking up a storm. My style of networking is less “awkward happy hour with other business professionals” and more along the lines of creative-focused meetups, the after work drink in Brooklyn (when the workday is done, I like to get out of Manhattan as quickly as possible), the office party featuring adult jungle juice and punch (what do you mean that doesn’t happen at your office parties?) and running out in the middle of the workday to check out an ultra cool company holding residency in a super cool incubator led by an amazingly cool museum (New Inc). While it was great to be out and about, make new friends and reconnect with old ones, it did make me wish I had scheduled time for myself. On the flip side, this week I’ve mostly come home after work and focused on catching up on personal things (buying gifts for birthday presents, signing up to run a half marathon in the fall). Overall, I believe in finding a balance in your life so there is equal time dedicated to everything that’s important to you, including work, family, friends, and your own personal projects. One of the events I went to last week was the New York August Meetup for the #100DayProject created by Elle Luna, The Great Discontent, and their partner FiftyThree. 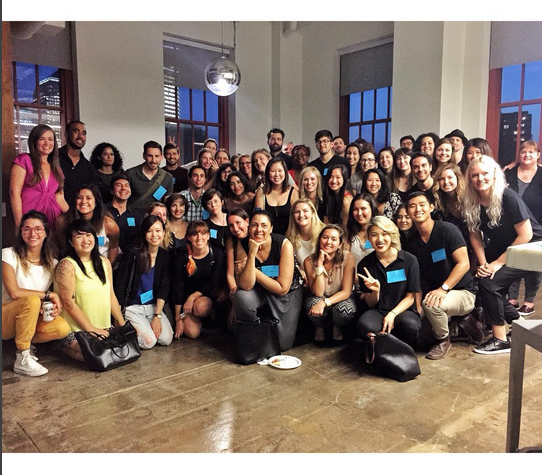 It was held in FiftyThree’s office in downtown Manhattan. They are by far the luckiest company because not only is their office beautiful, they also have an amazing view of the Hudson River. The meetup itself was full of people who participated in the #100DayProject. I started the project last spring with #100HoursofPainting, but quickly found that committing to a time versus producing 100 separate works was very challenging. I do admit that it caused me to experiment with abstract painting, which I never really tried before. Overall, the evening was incredibly inspiring. Elle Luna gave a great speech about how much the project mean to her and how amazed she was by its global reach. I found myself afterward much more motivated to commit to starting something that will lead to my ideal lifestyle, however small each daily accomplishment is. Goals are much easier to accomplish one small step at a time versus trying to climb a mountain of accomplishment all at once. I’m hoping to keep my focus on my side projects and keep committing to work on it daily, one small step at a time.